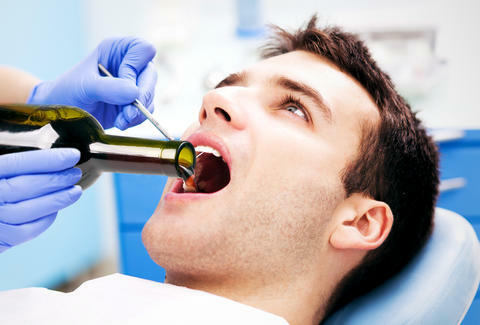 While most dentists' offices offer you little more than elevator music and an old copy of Highlights to calm your nerves before the main event, several New York docs are mellowing their patients out by basically turning the offices into wine bars. According to DNAinfo New York, several offices -- including The Dental Boutique, Park South Dentistry, and Marini & Manci -- have set up tables offering glasses of red and white in order to make the experience smoother. We suspect the red could also serve to sell more teeth whitening, but hey! Free wine at the dentist... this is gonna be the best root canal ever! Andy Kryza is a senior editor on Thrillist's national food and drink staff. His optometrist hands out complimentary beer at appointments, which might explain his constantly fluctuating prescription. Well played, Dr. Lee. Follow him face first into a wall via @apkryza.